I’ve met so many great writers online that I'm starting a new section of the blog to learn more about their lives and work. 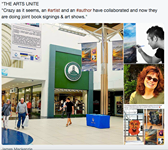 Writing can be such a lonely business, it's nice to keep up with what our fellow authors are doing. 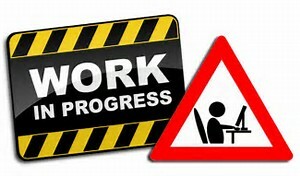 I'm calling these special posts "Writers In Progress" (a play on Work in Progress) because no matter where we are in our careers - bestsellers or newcomers - all writers are a work in progress. Every single one of us must sit down in front of a computer (or notepad or typewriter) and overcome self-doubt, face our fears, and listen carefully for the voices of our muses. There's no better example of a talented, determined writer like this than North Carolina author, Marcee Corn. 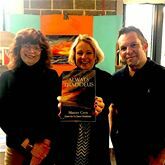 She's had such a successful summer launching her new novel, ALWAYS THADDEUS, that I wanted to learn more about it. Anyone who's met Marcee knows that she's a boundless source of enthusiasm, energy and support. 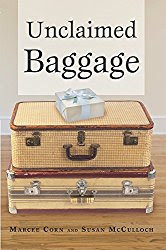 I met Marcee on Twitter around the time I read her wonderful first book, UNCLAIMED BAGGAGE (all the links are below), a heartfelt memoir about how her family managed to deal with her mother's worsening Alzheimer's Disease. Marcee's second book - and her first venture into the world of fiction - was released earlier this summer by Archway Publishing. 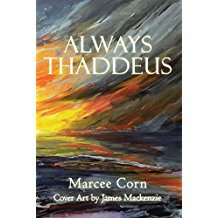 ALWAYS THADDEUS is part mystery, part love story, part tragedy, and was an instant bestseller in the literary fiction category on Amazon. Having been on book tours myself - in the U.S. and Canada - I was curious what tips Marcee picked up, because there's always lots to learn when you get in front of a crowd. Her appearances with James were a great success and she sold all but a few of the books the publisher ordered. I'll let Marcee describe her events in more detail, and then she can share the rest of her tips! 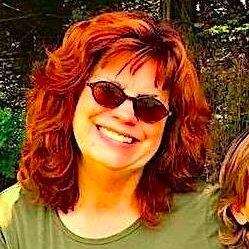 By the way, Marcee mentions her incredible book trailer for ALWAYS THADDEUS. If you haven't seen it, you must! It sets a whole new standard when it comes to book promo. All the links are below! And now, in her own words, Marcee Corn! Thank you, Sheri, for the opportunity to speak with you. While I'm still very steep on the learning curve, I'm excited to share the few things I learned over the past four years since the publication of my first book, UNCLAIMED BAGGAGE. Although some authors find book signing events, especially book talks, uncomfortable, marketing a book is every bit as important as the writing of the first word. 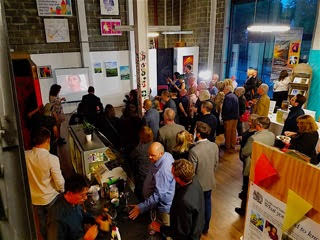 The first appearance was on September 15 and was a private, by invitation only Book Launch/Art Show at the Ideas Hub in Chelmsford (a non-profit community meeting hall). The event lasted from 6:30- 8:30 PM. Volunteers served wine and appetizers throughout the evening as a jazz guitarist played softly in the corner. There were approximately 65 people coming and going throughout the night. Ann, James’ agent, introduced us and then we showed my book trailer. I set it up by talking about the making of it and who was in it (including my son, Peter, who composed the fabulous soundtrack!). James and I then discussed our collaboration and we were both asked lots of questions afterwards. For the first time ever, people wanted photos of me with them holding the book…I've had photos taken before, but this time people were lined up to get one! It was so surreal and wonderful at the same time! This was really my favorite of all my book signings/author talks since UNCLAIMED BAGGAGE came out four years ago. 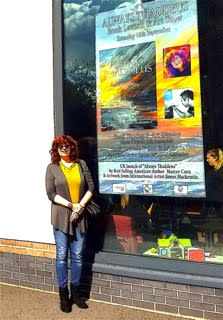 I loved all of my appearances, both big and small, but this event was really a dream come true for this indie author!! The other events were less formal, each about two hours long, with two at the Ideas Hub, and one held at the local library. 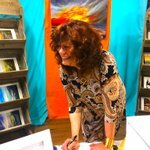 The last appearance had Vicky Ford, a member of the British Parliament, show up for a signed copy of the book! What an honor! As well as I know the characters and story in my books, I have learned that I still must prepare. At each book signing event, I have many one-on-one conversations with readers, as well as a question and answer session at the end of my talk. I get asked questions about my book, but also about writing in general, and most of the time some personal questions as well. I've been caught off guard a couple of times! The last one was recently when I was in Chelmsford and I was asked by a woman who my favorite English author was. I couldn’t think of one. How awful was that! Here I was in England and I couldn’t think of a single English author. 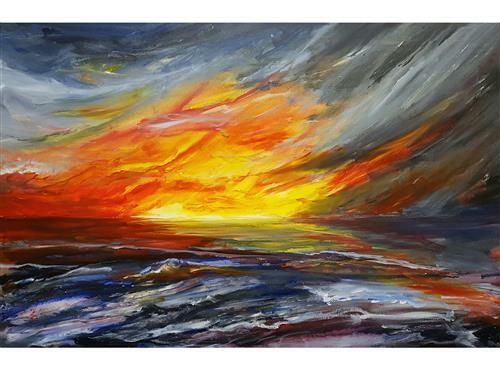 It turned out that she was an English teacher and I lost a sale because I was not prepared. 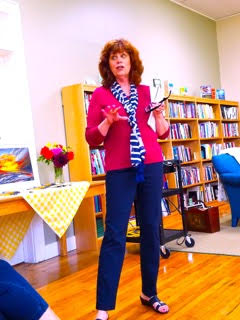 Another time, when I was doing a book talk to a book club about UNCLAIMED BAGGAGE, my memoir about my Mom’s journey through Alzheimer’s, a lady asked me a question about a character in the book named Edith. In UNCLAIMED BAGGAGE, Edith was the name I gave my grandmother. But Edith is not her real name. Since this was one of my initial book talks, I was nervous and couldn’t for the life of me remember who Edith was! My grandmother’s real name is Edna… and I purposefully chose her fictitious name to start with the same letter so it would be easy to remember. However it had been quite a while since I had reread my book, and I should have reviewed all my characters names and situations. Once again, I was caught off guard. I should have prepared better. When I'm asked to do a reading I've learned to practice reading the section out loud. I have a very wise writer friend that once told me this. And she is so right. While I am not an actor, I have found that it is equally important to portray the emotion you intend for the reading to express. You may feel silly sitting in your house, reading your book, aloud…over and over, but it is extremely important. It's important to be animated and to walk around in the front of the room while you're talking, if at all possible. I use my hands a lot when I talk and I think that keeps the audience engaged and a little bit entertained. I always try to keep my ‘talks’ light. At one of my most recent book talks in North Carolina, I did a reading with my husband. He was Andrew - the love interest of Sandy - I was Sandy. It was a light-hearted funny chapter in ALWAYS THADDEUS. My husband joked with the audience beforehand, saying that they would have to squint their eyes to imagine that he was the handsome, debonair, younger Andrew. Doing this particular reading was fun and the audience loved it. So, my advice here is to pick at least one reading that can be light and get your audience laughing and having fun. (Editor's note: Absolutely! Unless you're a professor sharing your new textbook with a lecture hall of grad students, remember that most people who go to a reading want to be entertained. Charles Dickens' readings were famously standing room only. He was very involved in all aspects of London theater at the time, and more than a passable actor, so he was able to act out the scenes with much aplomb. His appearance fees made up a good deal of his income. As Marcee says, Have fun! Because if you're having fun, everyone else will, too. 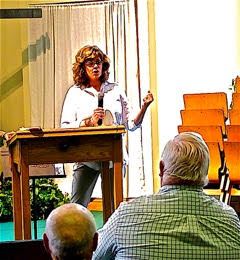 When doing my book talks on UNCLAIMED BAGGAGE, I found the audience loved to hear bits of information or story that was not included in the book. They somehow feel that they've gotten a “glimpse behind the curtain” of the characters' lives and of some hidden information that isn't shared with the general public. I usually start this part of my talk with a phrase like, “I have to tell you something that is not in the book.” This always piques their interest. -Arrive a few days ahead of the first appearance so you can catch up with the different time zone. -Carry a few comfortable outfits that are interchangeable. -Dress comfortably and if possible keep the higher heels at home in your closet. With five days of book signings events, I was on my feet a lot and the new boots with the high heels that I had recently bought, just about killed me. -Make sure you check currency and know what the exchange rate is on that day, so you can ask the correct amount for your book. -Have a way to take credit cards…we found out that the square (which I use in the US) does not work in a foreign country. We worked it out once we were there, but it was rather worrying for a bit. Here we had traveled all this way to do a book signing and for a short time we thought that we might not be able to take cards, and in turn sell books. Thank goodness it all worked out! -Whatever you do, bring a power converter so all your electrical devices can be charged. There is nothing worse than running out of battery on day one of a five -day tour! - I had my books printed by my publisher in the country that I was visiting to avoid expensive shipping costs. And remember, any books you have left will have to be shipped home. - Prepare to give away a lot of books. I gave ALWAYS THADDEUS to the event coordinators and all the volunteers who served food and helped set up. A small way for the author to say, thank you to everyone that helped make the event perfect. They were very appreciative and I think felt special. -The most important advice I can give…Have fun!! Meet all of your readers! Engage with them. I am a touchy person so one thing that works for me is to touch their arm as I talk with them. It makes me seem approachable and people seem to like the slight contact. Thank them for coming and smile a lot…and I mean a lot. After all the hard work of writing, editing, and then finally publishing your work, book signings and author talk events are, after all, the pot of gold at the end of the rainbow for the author. Have fun and enjoy yourself. This is your chance to be in the spotlight and more importantly, be able meet and talk with those who love your book! Thanks so much for giving us this glimpse into successful book launch appearances, Marcee! We know you're hard at work on the sequel to ALWAYS THADDEUS and we can't wait to read it! Good luck and happy writing! Good luck to you, too, James! By the way, if you have any more questions for Marcee or James, all the contact info is below. Marcee also happens to run a wonderful antiques shop in her hometown of Banner Elk, North Carolina, called The Twisted Twig Antiques. When this busy author isn't writing or making appearances, you can usually find her there! If you're ever in the area, stop in for a chat! Thanks again, Marcee!